Mohammedan Sporting Club bowed out of the ongoing U-19 IFA Shield 2017 as they suffered a 0-4 defeat to AIFF Elite Academy on Thursday at Mohammedan Sporting Ground. Naorem Roshan Singh’s (49th & 55th) barce and a goal each from Joysana Singh (2nd) and Lalnuntlunga (61st) sealed a convincing victory for AIFF Academy that guided them into the semifinals of the competition. AIFF Academy set the ball rolling from the start with swift short passes holding ball possession and went ahead as early as the 2nd minute through Joysana who guided Namgyal Bhutia’s free-kick into the back of the net with a delicate touch. 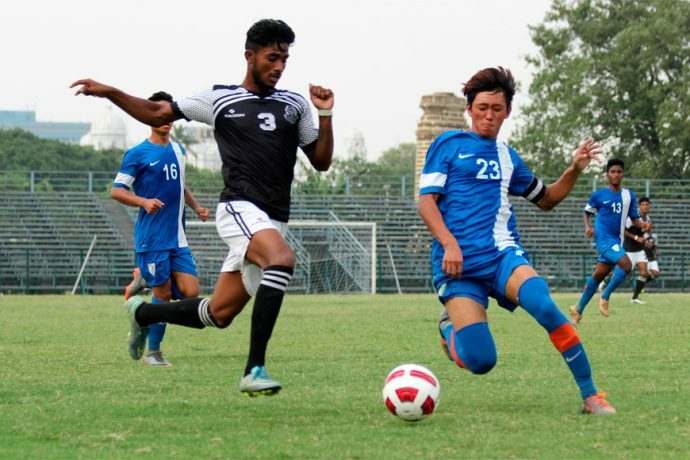 Having conceded early on, Mohammedn SC began attacking with intensity through Goutam Teli, Sachin Singh and Yenten Sherpa but rivals AIFF Academy managed to hold on defending deep as the first half ended 1-0. AIFF Academy were the better team in the second half who were dominating the possession and within four minutes into the session they made it 2-0 through Roshan. Meanwhile, Mohammedan SC almost pulled a goal back through Roshan Tamang in the 52nd miunte but the midfielder’s effort was denied by the AIFF Aditya Patra on the far post. Three minutes later, Mohammedan SC defense wilted under pressure as their citadel crumbled yet again when Roshan chipped one over from 25-yards out as keeper Syed Bin Abdul Qadir was nowhere near his goal. Then in the 61st minute, Lalnuntlunga rounded off the tally scoring with an angular drive to complete yet another comfortable win for the reigning U-18 I-League champions.